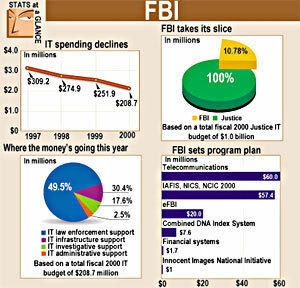 Increased funding and new software have rejuvenated the FBI Violent Crime Information Program. FBI special agent Wayne Wadell and crime analyst Loretta Gusberti use the ViCAP database to track down violent serial criminals. State and local law enforcement agencies in the early 1990s considered the program a bureaucratic black hole that swallowed information, FBI officials said. 'ViCAP languished for years,' program chief Arthur P. Meister said. The FBI in 1984 created ViCAP to analyze violent serial crimes. It is a unit of the Critical Incident Response Group's National Center for the Analysis of Violent Crime at the FBI Academy in Quantico, Va. But a lack of funding and staff hamstrung ViCAP in its mission to provide leads about cases involving homicides, missing persons and unidentified bodies Meister said. ViCAP's renaissance began six years ago when the FBI boosted funding to improve the unit's software and increase state and local participation. Since 1994, ViCAP has streamlined its data collection and sharing, Meister said. Before the changes, a law enforcement officer seeking ViCAP's help had to submit a 189-question form to the FBI for entry in a mainframe database, he said. A ViCAP analyst then conducted a comparative analysis against information in the database and identified any similarities to other cases. Between 1985 and 1997, however, the database only accumulated 17,000 homicide case entries from around the country. 'We only captured 3 percent to 6 percent of the homicides,' Meister said. The program team saw a need to redesign the forms and software, and the way law enforcement approached violent crime analysis, he said. By 1997, the unit simplified the data collection form'hewing the crime analysis computer form in half to 95 data elements. The form includes information, for example, about the position of the body, unusual marks or wounds, details about any weapons, and witness and suspect information. ViCAP also now provides law enforcement agencies with a software application based on the streamlined form and runs on any Pentium PC with a CD-ROM drive. FBI officials worked with the Energy Department's Sensing Laboratory in Las Vegas to develop the application, called New ViCAP. The software team used Sybase SQL Anywhere 5.5 from Sybase Inc.
State and local agencies can upload case forms to a regional or statewide database or to the national ViCAP Sybase Adaptive Server Anywhere 6 database. The database resides on a Sun Microsystems Sparcserver running SunSoft Solaris. ViCAP users tap it from Gateway GP Series PCs running Microsoft Windows NT. The new application lets ViCAP analysts point and click to retrieve data. The app also automates report generation, can support the creation of charts and graphs, and has comprehensive query tools. Meister said the ViCAP team wants to add features to download data to a case matrix; to scan images; to create, store and search time lines of offender activities; and to integrate a mapping tool. Law enforcement agencies can send the information via the FBI's Law Enforcement Online network, for secure, one-to-one communication between LEO members. State and local agencies can freely share information among themselves, Meister said. But once information is delivered to ViCAP, only the program's staff can tap the database, he said. Meister said state and local agencies have welcomed the new ViCAP application.